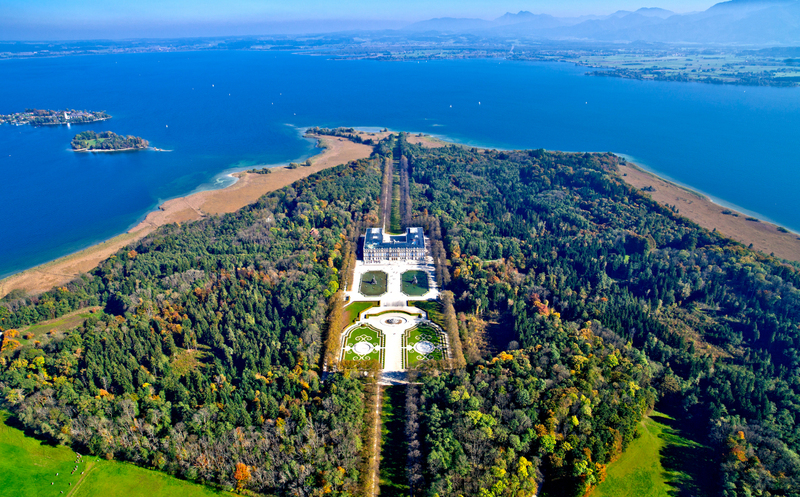 I don't remember where I first saw pictures or heard about Herrenchiemsee Palace, but when I realized it was built by Mad King Ludwig and you had to take a boat just to get to it because it's on an island, I added it to my master "Wanderlust" list as fast as lightning. 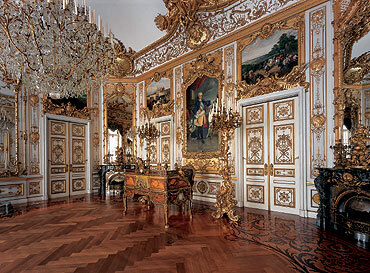 I'm ALL ABOUT castles and palaces and the craziness of Ludwig II! 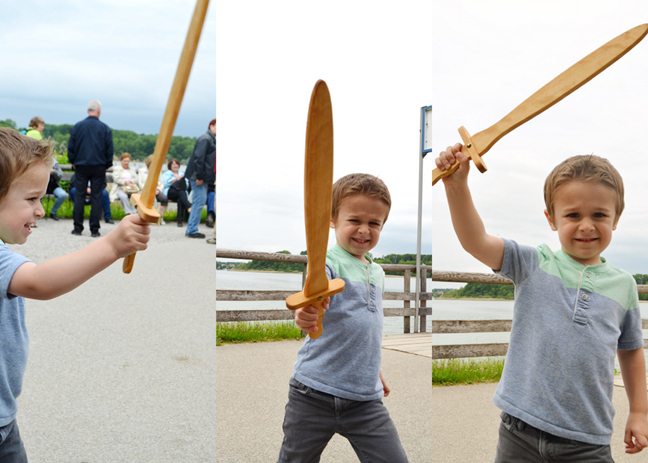 Turns out Herrenchiemsee is only 45 minutes away from Salzburg so we decided to visit it on the way. Last weekend we had a 4-day weekend so off we went into the hills of southern Germany and Austria! Our iPad wasn't working for the 3.5 hour drive, but we sang songs and read books and still had a jolly time. 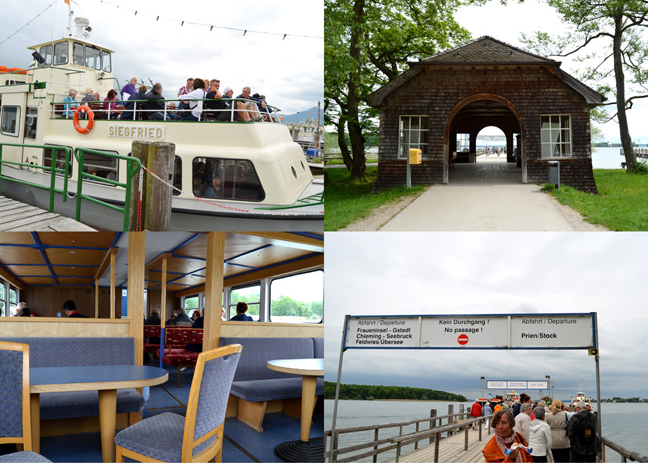 We arrived at the town of Chiemsee, parked, purchased boat tickets, then walked to the dock without a minute to spare. 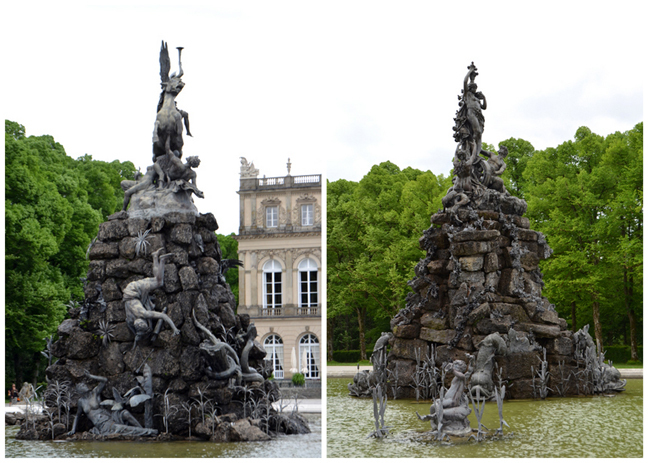 I love the King Ludwig pedestal. Creepy looking dude who remains a mystery, even in death. So fascinating. It was a good 20 minute or so ride out to Herrenchiemsee. Once on the island we had an hour and a half to kill before the English guided tour. So we got some lunch, browsed the gift shop, then walked to the middle of the island where the palace lies. Aerial view of this Versailles-inspired palace. 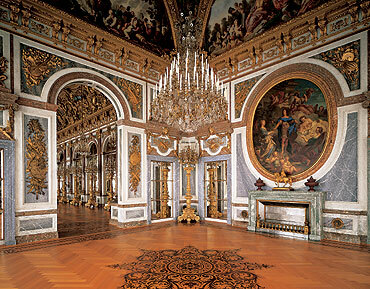 King Ludwig II had an, eerrrr, slight "obsession" with Louis XIV of France and planned to build a palace modeled after Versailles as an homage to absolutist rule including the State Bedchamber and the Hall of Mirrors flanked by the Hall of War and Hall of Peace. You can see all the way to the water from the front and back of the palace. Surrounded by fountains which were exploding water everywhere. 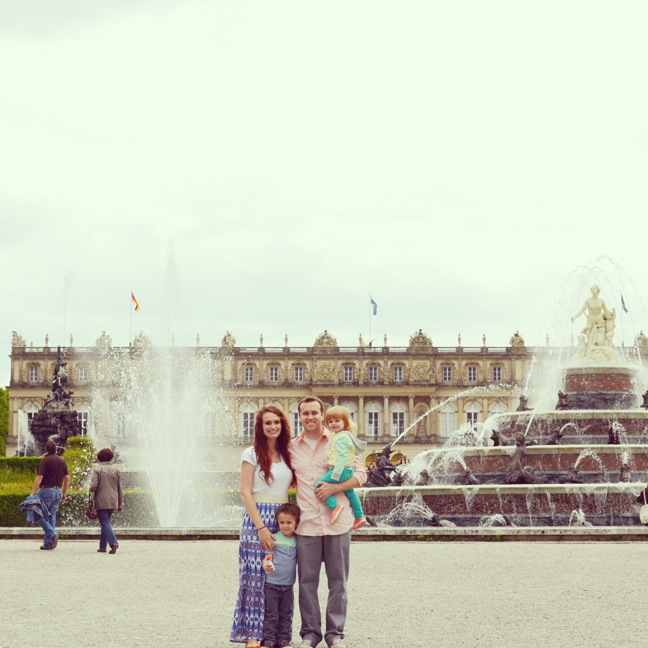 Our family in front of Herrenchiemsee Palace on Friday May 23rd 2014. The fountains all have names and stories, but it's the inside that most interests me. 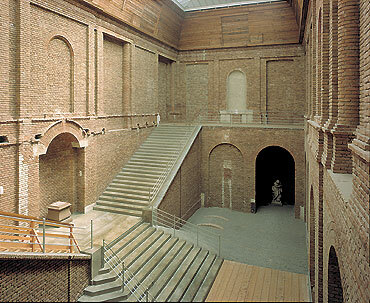 The back of the palace - the official entrance. The trees went on for miles! Not really, but it was a loooooooong way! Yeah, I could live here. 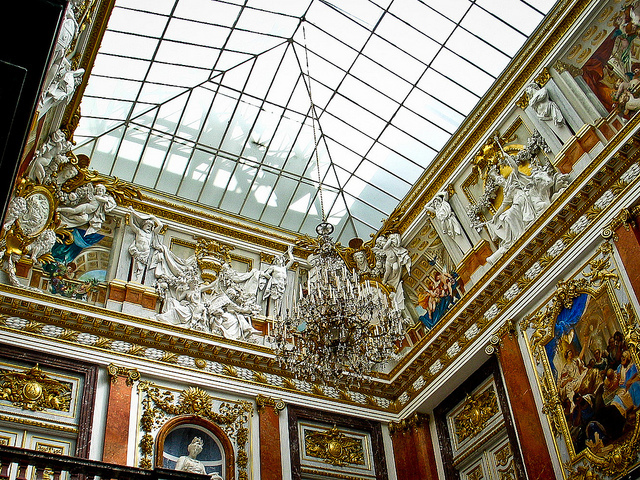 Imagine riding in a horse-drawn carriage up to this palace! Then it was time for our tour. We walked back around to the back and went inside. 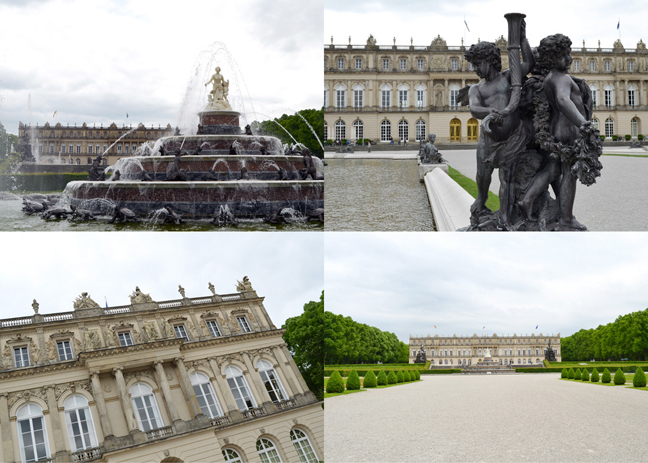 Pictures were "verboten" so these are all from the official Herrenchiemsee Palace website. 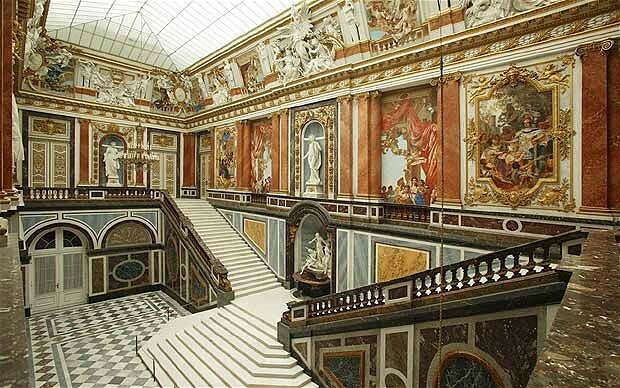 Our tour started in the State Staircase - modeled after the Ambassadors' Staircase at Versailles. Looking up in the State Staircase room. 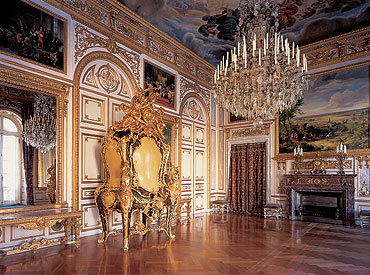 Then we ventured into the Royal Bodyguards room - similar to the 'Salle des Gardes" at Versailles. 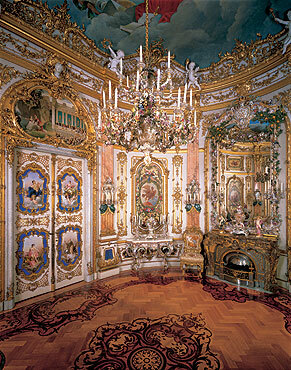 Then into the First Antechamber. Walls paneled in white and gold, doorjambs and wall panels of gray stucco marble. 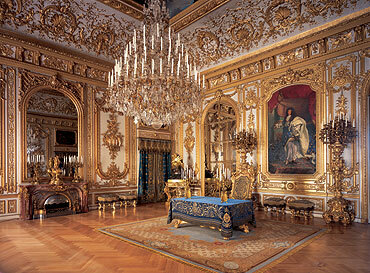 The inset paintings show scenes from the court life and military campaigns of Louis XIV of France. 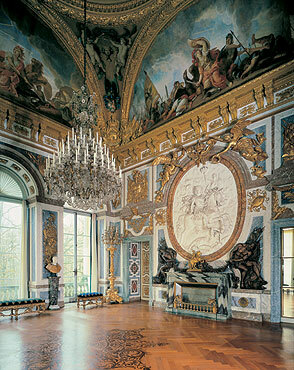 In the Second Antechamber the wide oval windows match the same room in Versailles, imagine that. 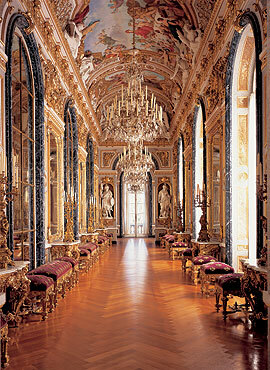 The two mirrors on the narrow walls are the biggest in the palace and give an infinite series of reflections. 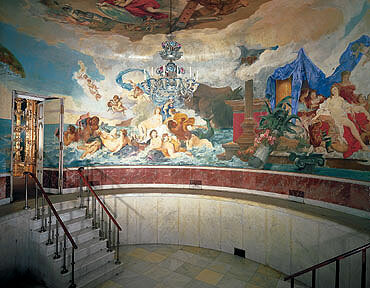 More large paintings of Louis XIV. 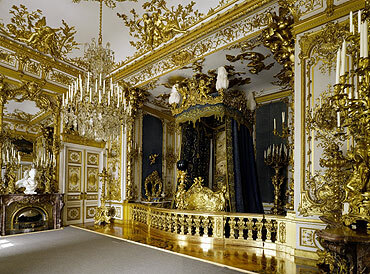 We know from Louis XIV's court ceremonial that the royal bedchamber was used for the first and last audience of the day. 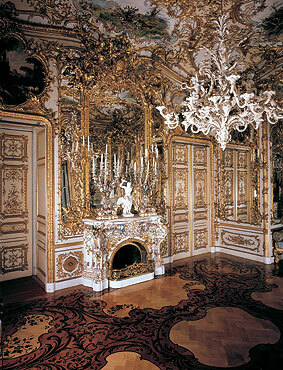 Ludwig never even used this room. 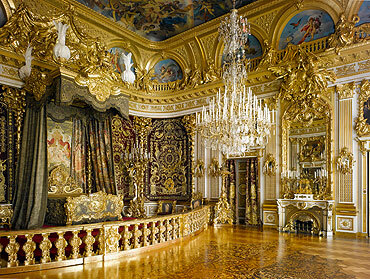 Our tour guide said this was the most expensive room to make in ALL OF EUROPE. Holy moly. And it was never even used. The Council Chamber - cuz every house needs one of those! 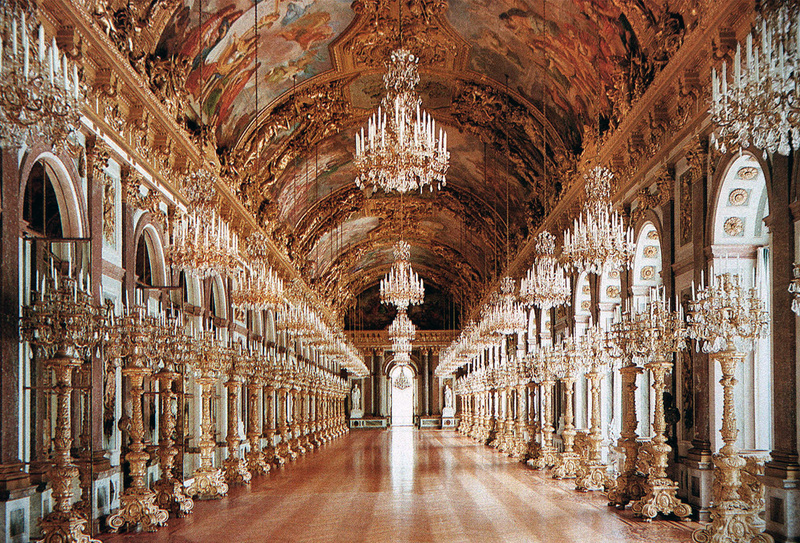 The Great Hall of Mirrors is actually longer than the one in Versailles. 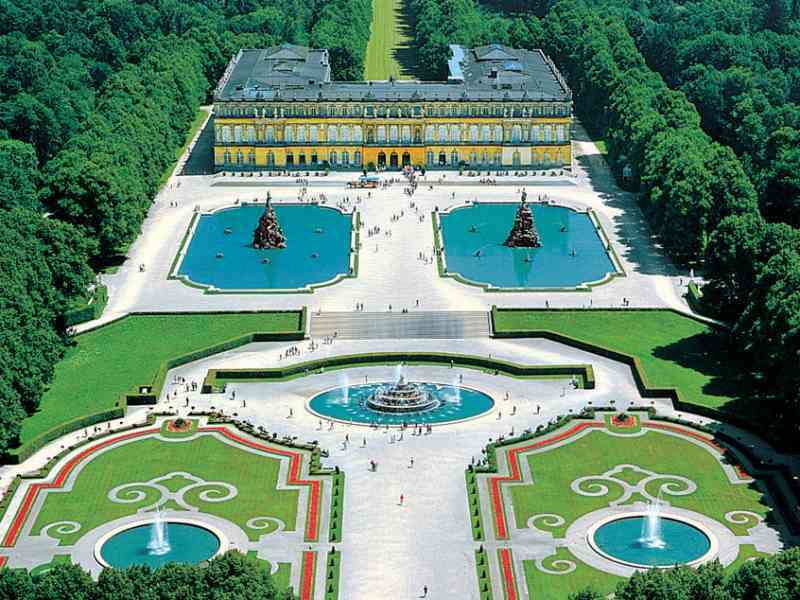 Together with the Hall of Peace and Hall of War it spans the palace's entire garden front. 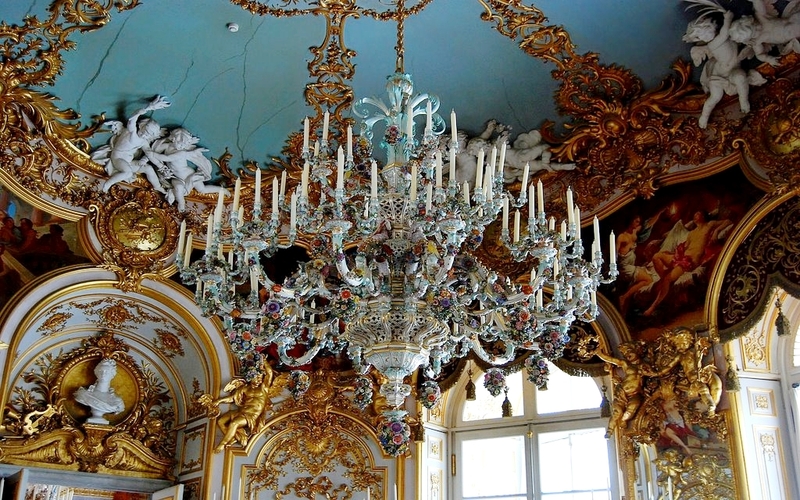 There are 33 glass chandeliers with 1188 candles. 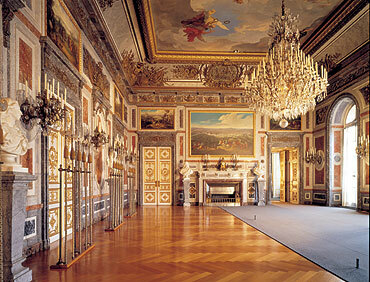 King Ludwig's actual living quarters - fenced off with a carved and gilded balustrade. The bed canopy hangings and upholstery took 7 years for women to stitch by hand. There is also a blue glass globe nightlight on a richly carved and gilded stand. The king slept here for 10 days of his entire life. TEN DAYS! 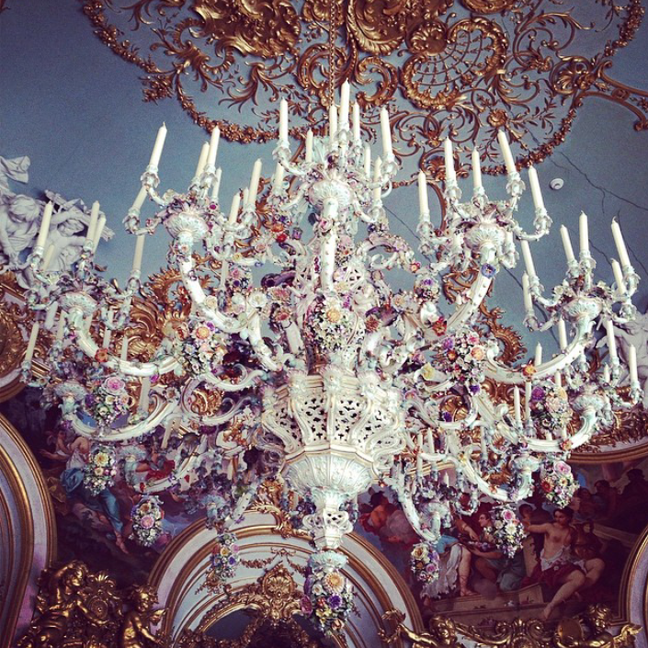 The Blue Salon - very Rococo and lots of Meissen porcelain. 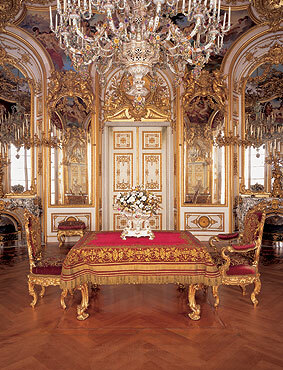 The Dining Room - the table could be mechanically lowered and this "magic table" enabled the King to eat his meals without servants in attendance. The Porcelain Cabinet - a room filled with, you guessed it, porcelain! The Bathroom - with a swimming pool sized "tub"! Only the central portion was built before the king died and construction was discontinued with 50 of the 70 rooms still incomplete. So this is what the rest of the palace looks like. Not quite as ornate! So. All that. For only 10 days. No one ever lived here before, and no one lived here after. 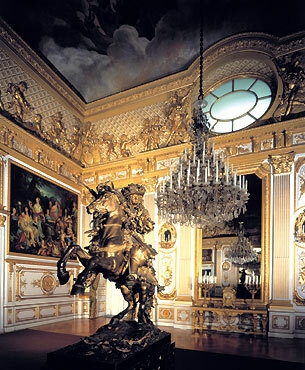 It was given to the State of Bavaria in 1923 by Crown Prince Rupprecht. Thank you very much! 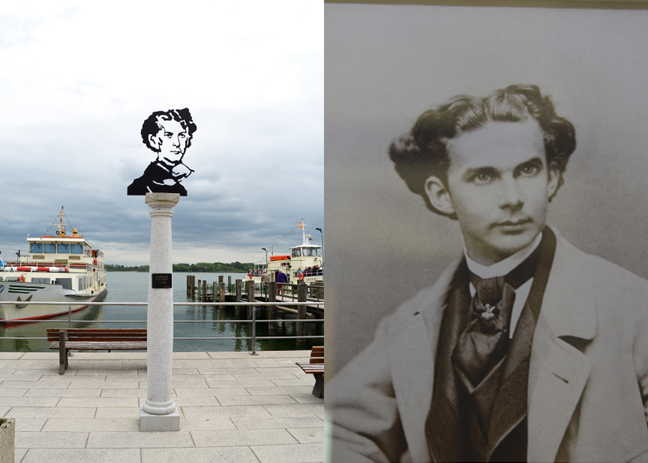 Then we went to the King Ludwig II Museum. Many portraits of the king on the wall. I could have stayed for HOURS! 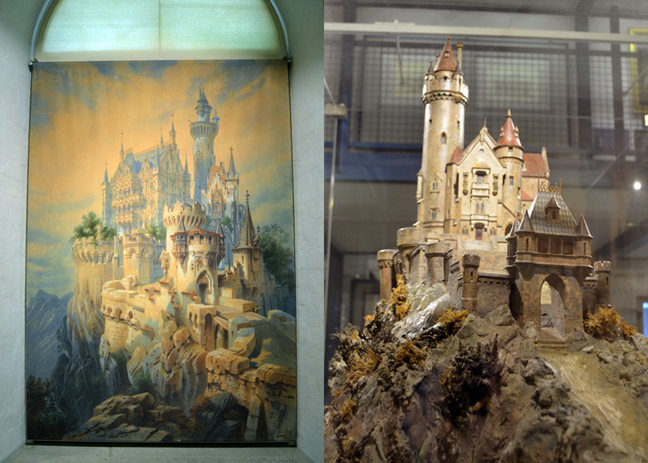 There was so much information about each of his castles: Linderhof, Neuschwanstein, Herrenchiemsee, and the castle he never built: Falkenstein. We walked back to the dock and waited for our boat. Meanwhile, who taught Fox how to do this? 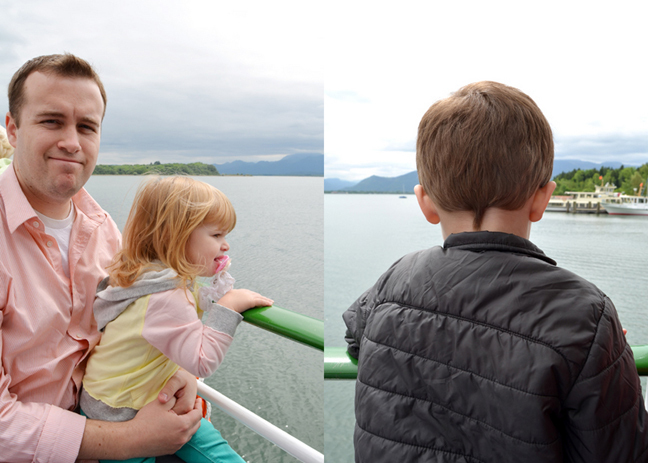 We got on the boat and sailed back to the mainland. 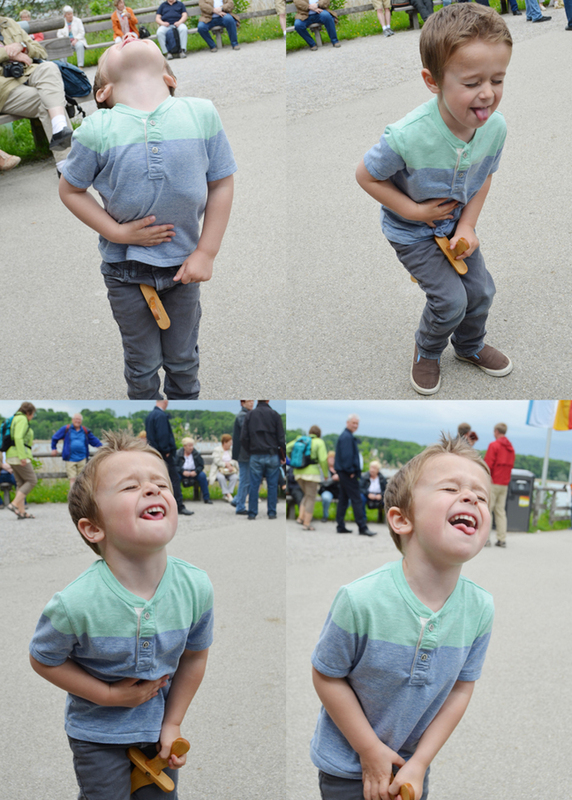 I hope we get to come back to Herrenchiemsee someday. Because it was amazing. Inside and out. What an amazing place ... I could so LIVE there ... I even only need one room!! LOL!!!! What an amazing place. He was definitely crazy or SOMETHING. Wow, Paige. Your hair is getting long. You need to wear it down in more photos. It's so beautiful!